The National Heirloom Exposition, http://theheirloomexpo.com/, is a not-for-profit event held annually in Santa Rosa, CA, centered on the pure food movement, heirloom vegetables, and non- genetically modified organisms (GMO) activism. Concerned women’s groups in New York City started the original pure food movement in the 1870s. Their goal was to clean up slaughterhouses in order to ensure safe and healthy food for their families and communities. Their vigilant activism eventually led to The Pure Food and Drug Act in 1906, which was the first of a series of laws to ensure food safety. This desire for safe and healthy food is still a concern over 100 years later! However, instead of slaughterhouses and women’s groups we now have GMOs and the Heirloom Exposition. The Expo brings together thousands of concerned citizens, along with sustainable agriculture activists, to continue the awareness and education about the best ways to grow healthy food. Ecology Action had the privilege of having a booth at this event in 2014, as well as in earlier years. This year John Jeavons, EA's Director, shared EA’s mission with an audience of over 150 people. Aside from the inspirational speakers and delicious food, a major highlight of the Expo is the Great Hall. 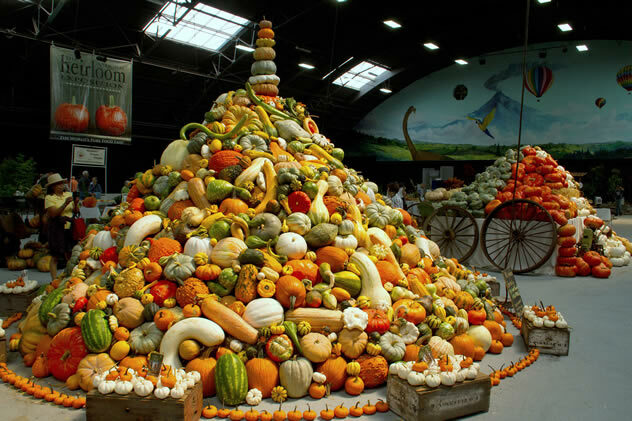 In the entrance, there is a giant tower of winter squash, surrounded by enormous pumpkins and hundreds of varieties of produce. The growers are often there, willing to share firsthand experiences about growing crops and selling seed. It’s not only a great opportunity to find the best seeds for your garden, it's awe inspiring to see the genetic diversity that can fit into one room! This Expo is very special for EA staff and interns, because we are able to connect with many amazing innovators and programs, while also gaining a more holistic understanding of how GROW BIOINTENSIVE mini-farming fits in with the greater sustainable agricultural movement. It is an annual opportunity for us to stay in touch with that movement and to further strengthen our bond with the local community. 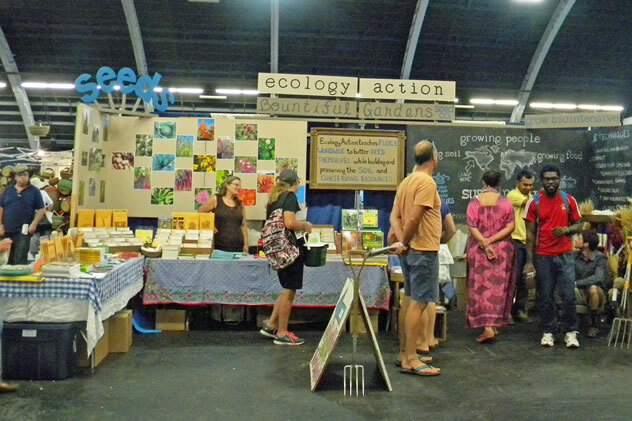 Ecology Action and Bountiful Gardens' booth at the Expo. 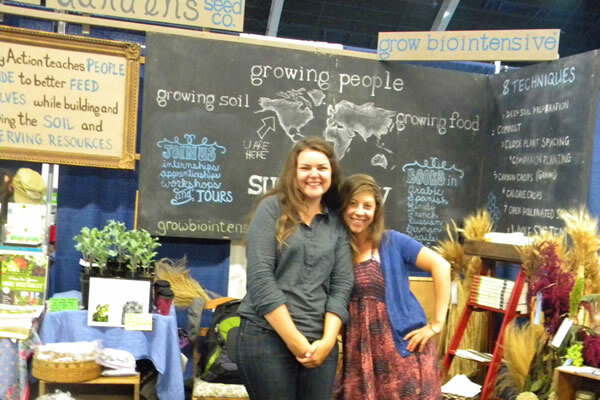 Rachel Lasse and Jes Pearce, 3 and 2-year apprentices, womanning the booth at the Expo.